The Earth resources satellite Landsat 3, here undergoing pre-flight tests, derived from the early Tiros and Nimbus weather satellites. Launched in March 1973, Landsat followed a polar orbit at a height of 917 kilometers (570 miles) that took it around the Earth once in every 103 minutes. As the planet turned beneath it, Landsat passed over a different strip of ground on each orbit, until after 252 orbits (18 days) it had surveyed the whole Earth. 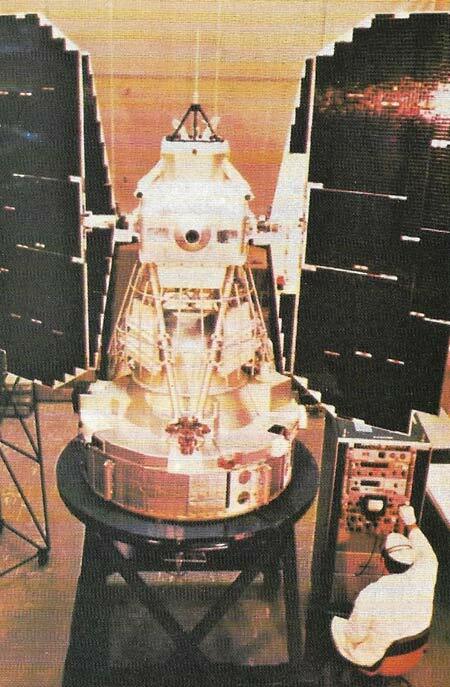 Landsat 3 had two camera systems. One took ordinary color pictures, while the other analyzed five wavelengths: red and green visible light, and three infrared wavelengths, to distinguish rock, soil, water, and healthy and diseased vegetation. Landsat is a continuing series of NASA Earth resources satellites, data from which are made freely available for public use. The Landsat program was originally known as the Earth Resources Technology (ERT) program, and Landsat 1 as ERTS-1; the name was changed by NASA in 1975. All the Landsats have been launched from Vandenberg Air Force Base.